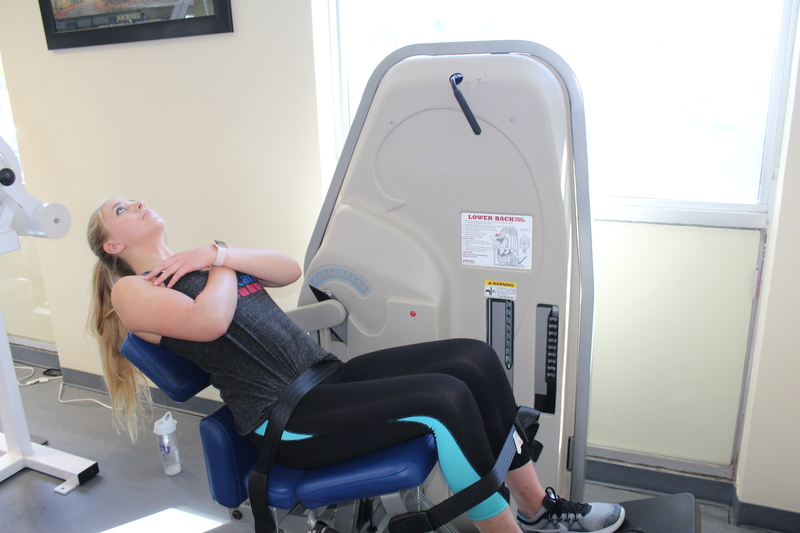 As a personal training studio specializing in Muscle Activation Techniques in the North Shore, people often come to us asking to help them with their low back pain. Low back pain is frequently cited as the #1 area for chronic and acute pain in adults. A huge component of low back pain is understanding how interrelated trunk motion is with hip mobility and strength. The Lumbar Spine (lower 5 vertebrae) can only rotate about 5-10 degrees in each direction (left/right). When rotating the “trunk”, most of that movement is coming from the hip joints (pelvis rotating on a “fixed” femur – or “thigh bone”). To reduce stress on the low back, it is essential that the hips are strong with adequate mobility. To effectively strengthen the hips, you must create an appropriate challenge through all the different directions the hip can move. This requires well-designed equipment and a knowledge on how to create/apply force appropriately. It is essential to work on hip extension, flexion, abduction, and adduction. In addition to these more common hip motions, it is very beneficial to work on strengthening other planes of motion as well as hip internal/external rotation, particularly if there are any imbalances in strength or flexibility one side versus the other. The best way to strengthen these movements is to progressively increase the challenge to the muscles into more range of motion as flexibility increases. As strength and stability increase, so will flexibility (assuming the joint is structurally capable of increased flexibility). Traditional static stretching is not an effective method to increase this joint stability or long term flexibility. The most effective way to avoid back injury is to maintain good strength through all ranges of your hips and spine! Strengthening in a controlled environment will allow you to tolerate the forces required during uncontrolled life situations that place a demand on our bodies every day. With over 20 years of experience in the health and fitness industry, Steve has guided hundreds of clients to reach and exceed their fitness goals and objectives. He has done this by being a true student of the human body and helping people believe in their own ability to take control of their health and make positive lifestyle changes.. With a solid background in Athletic Training, Orthopedics and MAT, he has fully dedicated his life to helping people overcome their physical obstacles in order to live a stronger and more active lifestyle. Steve shares his love for fitness with his wife, who is a competitive distance runner still in her 40’s and works on maintaining her strength as well. He has been blessed with 3 healthy kids that keep them plenty busy!